Almost all of us are using or have used Gmail at some point of time. Users of Gmail rely pretty heavily on auto complete to add recipients. Auto complete is a functionality which suggests the recipients when you type in ‘To’ , ‘Cc’ or ‘Bcc’ boxes. Till now we had to remember the name, mail id or at least a few characters of any one or both to utilize Auto complete feature for adding recipients to whom we want to send a mail. This generally becomes difficult as the number of contacts grows in your list. To make the things more easier, Google has added Contact chooser option in Gmail. This enables you to see all the contacts and choose all or some of them by clicking on any of them. Just click on ‘To’, ‘Cc’ or ‘Bcc’ as shown below and and Contact chooser is at your service. Below is the contact chooser window which will appear on clicking on any of the above. Further, you can also choose a specific group through the drop down as shown below and Contact chooser will show you all the contacts of that group. To view and choose from all the contacts, just select ‘All contacts’ from the drop down. Well, this is indeed a usefull feature which will enable you remember all the people you want to include on your email. So, what are you waiting for. Just give it a try and share your opinion on the same. 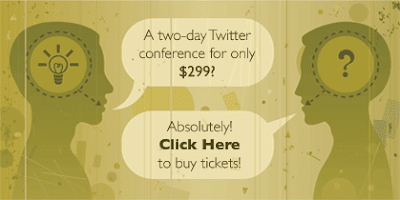 Well, its not free but if interested, you can join two days Twitter Conference in LA for $299. If you’re interested in joining with Alex, Ryan and a whole bunch of Twitter enthusiasts ranging from businesses to celebrities, check it out. The exact date is September 22nd-23rd, 2009, at the Skirball Cultural Center in Los Angeles. Alex and Ryan work in the platform team without which all the cool Twitter apps we use and love would not be possible. The purpose of the meet is to share information, discuss ideas, and hanging out a bit. If that’s not enough, there’s an open bar on the first night. Google has released a feature for Google Docs to make multi-lingual sharing easier — you can now automatically translate documents into 42 different languages. Now, you can very easily share your document, which are in English, with your friends, colleagues, relatives etc who are not very much confident with English. Just translate the document using this new translate feature and share it. So, how to do that. Well, its quite simple. 1) Upload the document (word or notepad). Here I have uploaded a document ‘Translation.txt’. You might already uploaded documents. In this ase just go to step 2. 2) Open it by clicking one and you will find ‘Translate document’ option under ‘Tools’ as shown below. Once you translate a documents to a specific language, you will be given options to either replace the original document with the translated one or save the translated document as new one. Below is an example of translation of above document from English to German. If you select ‘Copy to new document’ then new documents will be named as ‘Copy of <Document name>’ (Copy of Translation in current example) and will be saved in your inbox as shown below. Microsoft Corp is slashing the price of its high-end Xbox 360 model by $100,giving compitition to Sony PlayStation 3. Though Microsoft spokesman David Dennis said the price cut has been in the works for some time, and was not a response to Sony’s move, which was announced last week yet the decision seems a repercussion of Sony’s decision of cutting down the price of its Playstation 3 to $299, considering the situation. Microsoft will drop the price of the Xbox 360 Elite to $299.99. Well, whatever be the reason because of which Microsoft is reducing the price of Xbox 360 Elite. The good news is that Xbox 360 Elite will fit into the budget of may more gamers :). It is only some time ago Google launched Google services for websites. For example, Google webmaster tool which help you understand site traffic, Google Custom and Site search which helps you in adding search functionality on your webiste in no time etc. The features help you to drive traffic to your websites, enhance your sites and improve user retention. 1) Web Elements allows your customers to enhance their websites with the ease of cut-and-paste. Webmasters can provide maps, real-time news, calendars, presentations, spreadsheets and YouTube videos on their sites. With the Conversation Element, websites can create more engagement with their communities. The Custom Search Element provides inline search over your own site (or others you specify) without having to write any code and various options to customize further. 2) Page Speed allows webmasters to measure the performance of their websites. Snappier websites help users find things faster; the recommendations from these latency tools allow hosters and webmasters to optimize website speed. These techniques can help hosters reduce resource use and optimize network bandwidth. 3) The Tips for Hosters page offers a set of tips for hosters for creating a richer website hosting platform. Hosters can improve the convenience and accessibility of tools, while at the same time saving platform costs and earning referral fees. Tips include the use of analytics tools such as Google Analytics to help webmasters understand their traffic and linguistic tools such as Google Translate to help websites reach a broader audience. Do take advantage of the tools. If you are already using all or any of them then do share your experience. If you need a simple, yet very efficient tool to convert (encode) or play any Multimedia file, without reading manuals or spending long hours training, then SUPER © (Simplified Universal Player Encoder & Renderer) is all you need. It is a Multimedia Encoder and a Multimedia Player, easy-to-use with 1 simple click. The best thing is that it is absolutely free. SUPER © “The Player” surpasses any known player by supporting just any Multimedia file format. SUPER © plays files that cannot be played with WMP or even other libavcodec-based players like MPC and VLC. SUPER © also plays and saves Internet Media Streams of different protocols ( mms:// rtsp:// http://). Video format: 3gp, 3g2, amv, asf, avi, dat, dvr-ms, fli, flc, flv, m2ts, mpg, mkv, mov, m4v, mp4, nsv, ogm, qt, rm(vb), str, swf, ts, trp, ty, ty+, tmf, viv, vob, wmv. Audio Format: aac, ac3, amr, flac, mmf, m4a, mp2, mp3, mpc, ogg, ra, wav, wma. and many more. Click here for detailed information and features of Super ©. with so many supported formats, Super © gives you the flexibility to convert tons of video/audio from one format to another. So want to view your favourite video in you mobile phone, ipod, or iphone? Well, SUPER © will do this for you by converting any supported input file to the required format. The setup file is approx. 27 MB in size. Installation of the application doesn’t take much time. After the installation, when you run SUPER ©, it tries to connect to internet to download some of its component. Therefore, do make sure that none of your’s firewall or antivirus doesn’t block it. 2) select Apple – ipod/iphone (MP4) from the drop down juts beneth ‘Select the Output Container’. The same is shown below. The other drop downs namely Video Codec and Audio Codecwill be selected automatically. When selecting the “Apple – iPod / iPhone (mp4)” profile, check the “Disable Video” switch to render a valid “Apple AAC audio for iTunes”. 3) Right click on the input window and add the file to be converted by clicking ‘Add Multimedia File(s)’. 4) Click on ‘Encode (Active Files)’ to convert selected file. If name of the selected file is Song.mp3 then the converted file will be given a name Song.mp3.MP4. You can remove .mp3 and rename it as Song.MP4 afterwards. This was just an example. You need to explore SUPER © by yourself to know the full potential of the application. Google expands YouTube Mobile App to five new languages.